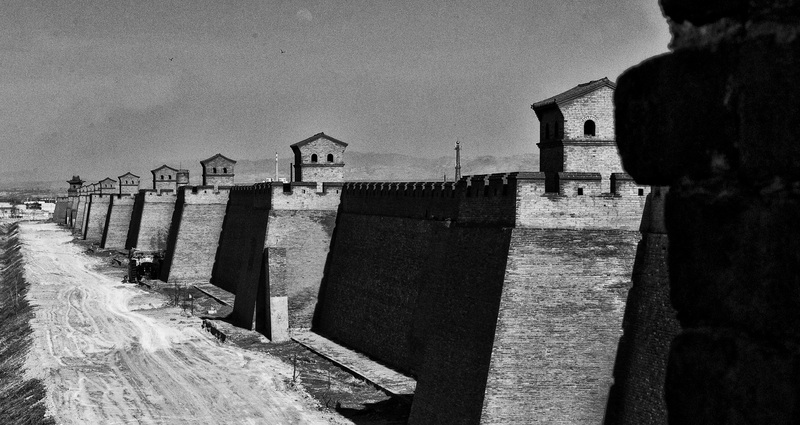 The city walls of Pingyao were constructed in the 3rd year of the Hongwu Emperor (1370). The walls have six barbican gates. The north and south sides have one gate each. The east and west sides have two gates each. This pattern is similar to that of a turtle (the head, tail and four legs), earning Pingyao the moniker “Turtle City.” The walls measure about 12 meters high, with a perimeter of 6 kilometers. A 4-meter wide, 4-meter deep moat can be found just outside the walls. Aside from the four structured towers at the four corners, there are also 72 watchtowers and more than 3,000 battlements. In 2004, part of the southern walls collapsed but were reconstructed. However, the rest of the city walls are still largely intact and are considered among the best-preserved ancient city walls on this scale. This makes the city walls the centerpiece of the Heritage Site. I saw a documentary (in Korean) about the construction of this wall. What a fantastic story. The technique is amazing and why the wall is still there. Its amazing to see construction which has stood the test of time. On the outerside of the wall you can see where cannon balls and gunfire have hit the wall during various battles throughout history.